I’m a fan of religion. That sounds glib, but I’m not sure how else to put it. My own religious upbringing was a bit unusual. I was raised deep in the Bible belt in a non-religious household—my mother was an ex-Catholic atheist, and my father was a non-practicing Catholic, so I embraced atheism around the age of 8. By 15, I had discovered Eastern philosophy and become fascinated by Taoism. By 19, the Neo-Pagan movement was on, and I explored Wicca for a time. Over the years I’ve been to services and rites of, taken college courses and read numerous books on: Catholicism, various forms of Protestantism, Unitarian Universalism, Hinduism, Judaism, Islam, Buddhism, the pre-Christian religions of Europe, Taoism—you get the picture. What can I say? I dig the sacred. One of the great pleasures of working at the Getty Villa is that it has given me the chance to delve more deeply into ancient religion. A fascinating aspect of working with classical art is seeing the many things we still share with the ancient Greeks and Romans, in how they lived and thought. But when it comes to religion, things today are extremely different on many levels. Ancient religion was wildly diverse—there was a panoply of gods and goddesses, major and minor, plus hero cults. We certainly have numerous religions today, but many tend toward the mutually exclusive. Ancient religion could be (not always, but often) remarkably syncretic. That’s when you meet someone from a different religion and they tell you about their gods and you say, “Oh, you’re calling that guy Krishna. In our land we call him Herakles.” It’s a system of belief in which it’s possible not only to see two different gods as the same god, but even to merge gods. 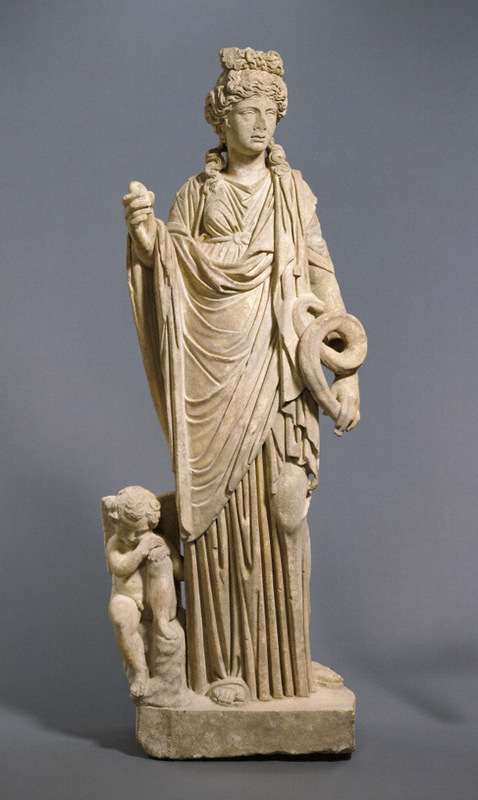 In the Roman statue below, for example, you can see elements from two goddesses: Hygieia, the goddess of health, typically holds an egg, wears a heavy cloak and carries a snake. But she has the hairstyle of Venus (in Greek, Aphrodite), and her son Cupid is at the statue’s feet. While today you may find independent writers of spiritual matters postulating connections between figures like Jesus and the Buddha, chances are you’re not going to find any church merging the two anytime soon. Being a student of many religions, and a lover of cafeteria-style spirituality, I can really appreciate the ancient system where borrowing, amalgamating, and generally mixing it up was perfectly acceptable. The ancient world was filled with the sacred in a way that is hard for us, at least in the West, to imagine. Temples were sacred spaces, but so were rivers, groves of trees, caves, and household shrines. Religion permeated all aspects of life. Not only did religious festivals happen pretty much every few weeks (providing much-needed respites in a world without weekends to rest from work), but just about every activity involved some interaction with the sacred. 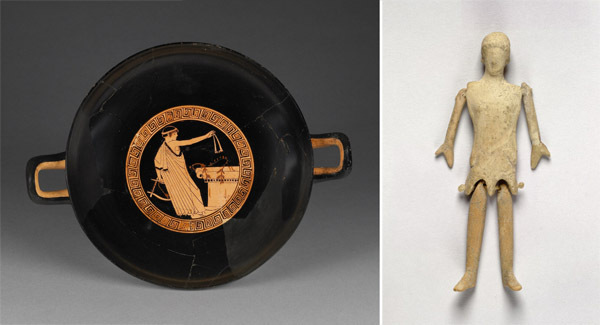 A lot of these interactions meant the giving of gifts to a temple, and a great deal of the wonderful works of art on display at the Getty Villa are these remarkable offerings and dedications. 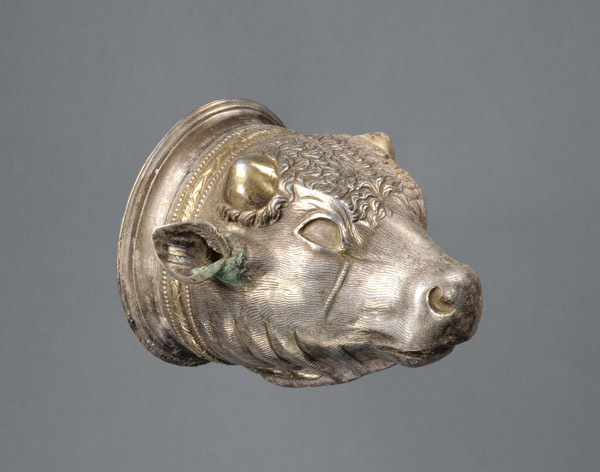 The luxury drinking horn below may have been an offering to Artemis. The Aramaic inscription—which continues to puzzle scholars—has been interpreted as referring to Artemis. Then again, it’s also been interpreted as a much less mysterious message: a weight record. The fact is, we simply don’t know; the object itself still contains mysteries. In most modern-day depictions of Greek temples, they are shown as pristine, white-columned buildings in wide-open spaces. In reality, the sanctuaries were often cluttered with statues and other gifts, ranging from extremely expensive luxury items, like the stag horn, to the very humble and personal. 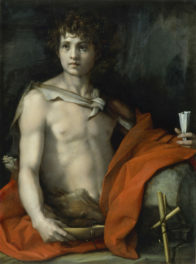 Below you’ll see a depiction on a wine cup of a young man dedicating the mouth strap of his aulos, a wind-instrument. He may be asking for a god’s favor in an upcoming musical contest, which was a common pastime of well-born youths. Then there’s one of my favorite objects in our collection, an unassuming handmade clay doll with articulated shoulders and hips. This was probably not a toy, but a gift to the gods. What exactly it signified is mysterious to us, though scholars suspect that these images of women may have been hung up and the sound of their rattling arms and legs provided protection from evil spirits. They are often found in graves and sanctuaries. Mystery is a big attraction to me; the grand mysteries of life remain as mysterious in our rational scientific age as they were in ancient times, and they seem to me the very origin of the concept of the sacred. And I often encounter mysterious objects most probably related to ancient religion as I walk around the museum. A favorite is this tiny, carved gem which depicts an odd, snake-legged creature whose identity and meaning are obscure. 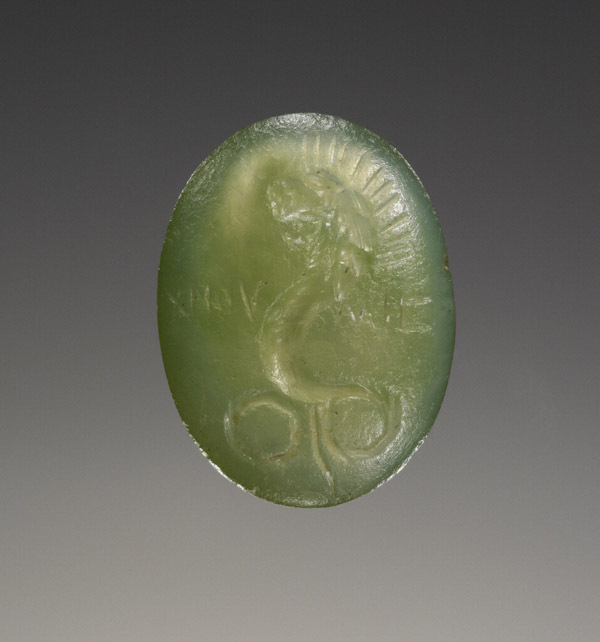 This gem depicts Chnoubis, a hybrid solar deity with the head of a lion (with solar rays) and the body of snake. Snakes move between the surface and subterranean realms, and thus have chthonic associations, and I don’t just bring this up because “chthonic” may be the coolest word in the English language. Chthonic deals with things below, buried, from deep in the earth, and often has to do with death. There was a polarity to ancient religion—ceremonies to the Olympian gods happened at sunrise; white animals might be sacrificed with head pulled back so that the throat pointed up; and animal bones and fat were burned so that the smoke rose. Ceremonies to the dead and chthonic deities, by contrast, happened at sunset or nighttime, and black animals might be sacrificed with blood flowing directly down. Ancient religion involved a good deal of animal sacrifice, in which the creature’s blood sanctified an altar and its meat was ritually eaten as part of the ceremony. This to me seems a more honest acknowledgement of the hard fact that life lives by killing, than in our world where children frequently don’t fully realize until they are 10 years old or more that the chicken they eat was once a living, breathing creature of blood and muscle. I’m a fan of religion because, despite the passage of time, humanity continues to grapple with things much bigger than ourselves—birth and death, joy and suffering, awe and terror. I have yet to run into a religion that didn’t manage to open my mind to the varieties and fundamentals of human experience. This week, I plan to explore objects and concepts, big and small, with which the ancients grappled as much as we do today. 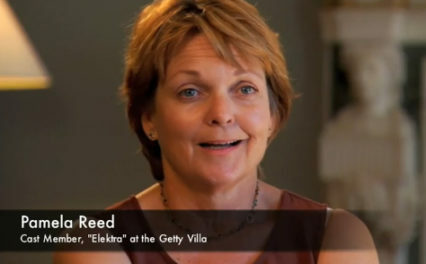 I like to learn about the ancient artifacts housed at the Getty. Thank you for such an informative article.